Lisa Wynn of Macquarie University has posted an online survey asking for ethnographers' "subjective experience of ethics oversight – their memories of when and how they first became aware of ethics oversight, what they think and feel about it, whether and how they comply with it, and whether they think it makes ethnographic research more ethical or not." 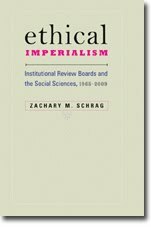 Since I will publish Wynn's findings in the special issue of the Journal of Policy History I am editing, I naturally hope that researchers embrace this opportunity to help us understand the evolving role of IRBs and other ethics oversight bodies in the social sciences. Note that Wynn defines ethnography broadly to include "any discipline that uses ethnographic research methods, including, but not limited to, anthropology, sociology, political science, history, geography, linguistics, Indigenous studies and area studies."